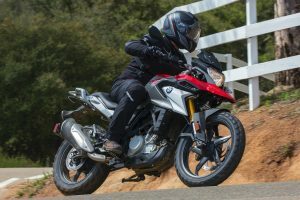 With the introduction of the BMW G310 GS to the market, it looks like the latest trend in the world of motorbikes is miniature adventure bikes. The latest edition of motorbikes launched by the German manufacturer is designed to handle all types of terrain that you can imagine. It also comes with a price tag that extremely unusual from BMW. Has the German manufacturer got what it takes to produce an incredible yet cheap motorbike? Let’s take a look! When you first set your eyes on this machine, you will find that it has high-quality aesthetics. The attention to detail is brilliant as the motorbike looks incredible. On top of that, the paint finishing on the miniature adventure bike is gorgeous. As the motorbike has to handle different types of terrain, the suspension needs to be phenomenal. In the front suspension, you will find an upside-down fork while the rear has an adjustable-preload single shock. The result is excellent as the motorbike can absorb rocks, pot-holes, and bumps without any problems. Since the motorbike will be spending a large portion of its time off-road, the German manufacturer fitted in radial four-piston brake callipers while the rear has single-piston floating callipers. The brakes have more than enough stopping power to bring this light-weight motorbike to a complete halt in a short span of time. Even if the motorbike dives in front when you slam the brakes, the suspension will absorb the impact. You also get ABS on the motorbike so that you get optimal control on the road. Even if you don’t turn off the ABS when you go off-road, you won’t even realise that it is on. When you fill the fuel tank up to the brim, the motorbike weighs only 169.5 kg. Thanks to its aluminium swing-arm, the motorbike is easy to handle. On top of that, as the motorbike is nimble and quick, you can go through the gaps and corners like it didn’t even exist. Under the BMW G310 GS, you will find a four-stroke, water-cooled, single cylinder engine that produces 34 hp of power at 9,500 rpm and torque of 20.65 lb-ft at 7,500 rpm. The fuel injection system in the BMW G310 GS is electric. Thanks to its 313 cc engine, the motorbike can reach a top speed of 143 km/h. The motor is different from other motorbikes because of its reversed cylinder. As a result of this, the centre of gravity is low. It also increases the amount of weight, in the front part of your motorbike. According to BMW, the motorbike can cover 85 mpg, giving it a maximum range of 206 miles. The BMW G310 GS is an incredible motorbike that joins the club of miniature adventure bikes. The power provided by the engine is optimal while remaining economical at the same time. You get good control on the BMW G310 GS because of its design changes, weight, ABS, and brakes. You can pick up a BMW G310 GS for a price of £5,100, which is an absolute steal!